Check it out! 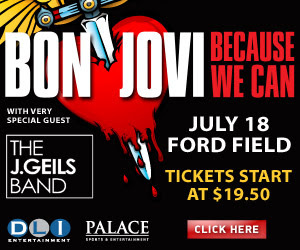 Bon Jovi is coming to Ford Field in Detroit on July 18, and it was just announced that their special guest is the J. Geils Band! I don't know if I'm the only one who feels like I'm aging faster than I should, but it's good to see some names I recognize and not feel so out of the loop! If these guys can still rock, so can I, right? As I was accessing an account the other day, it wanted me to update my security question. One of their options was, "What was the first concert you attended?" And I wasn't even sure anymore.